Since the invention of the periodic table 150 years ago this month, scientists have worked to fill in the rows of elements and make sense of their properties. But researchers have also pursued a parallel quest: scouring the cosmos to figure out where all 118 elements came from. After centuries of effort, they have determined that the vast majority of elements were forged in the fiery lives and strange deaths of stars. They now pervade galaxies, infusing the next generation of stars and planets with chemical diversity. Indeed, every element on Earth—except for a few made recently by humans—was inherited from the nebula that gave birth to our solar system 4.5 billion years ago. That includes the iron in our skyscrapers, the silicon in our computers, the gold in our jewelry, and the calcium in our bones. "There's a real connection between our galaxy—our universe—and our humanity because of the elements." said John Cowan, an astrophysicist at the University of Oklahoma. So how did nature fill up the periodic table? The story starts at the beginning. Within 15 minutes of the Big Bang, atoms of hydrogen (atomic number 1) coalesced out the cloud of newborn particles as it expanded and cooled. Some of them quickly combined to make helium (atomic number 2). These two elements still make up 98 percent of the universe, and they are the primary ingredients in stars. A pioneering astronomer named Cecilia Payne-Gaposchkin discovered this when she published the first accurate estimate of the sun's composition in 1925, overturning the prevailing belief that it was similar to Earth's. The very first stars formed about 100 million years after the Big Bang, said Jennifer Johnson, an astronomer at Ohio State University who wrote a review of elemental origins in Friday's issue of Science to celebrate the sesquicentennial of the periodic table. These stars were massive, and for millions of years, they generated energy by "burning" hydrogen—combining atoms into helium through nuclear fusion the way the sun does today. Eventually, however, all stars run out of hydrogen fuel. Then they start making increasingly heavy elements at an increasingly frenetic pace, populating the next three rows of the periodic table in the process. For a while, they burn helium into carbon (atomic number 6) and oxygen (atomic number 8). In the final centuries of a massive star's life, it converts carbon into elements like sodium (atomic number 11) and magnesium (atomic number 12). In the final weeks, oxygen atoms fuse into silicon (atomic number 14), phosphorus (atomic number 15), and sulfur (atomic number 16). And in the very last days of a star's very long life, it produces metals like iron (atomic number 26). There's something wonderfully prosaic about that, Johnson said. "That's a human timescale." Next comes what astronomers ominously call the "iron catastrophe." Fusion cannot combine elements heavier than iron, so the star abruptly runs out of juice. "It goes into free fall," Johnson said. In less than a second, the star collapses on itself and then explodes as a supernova—spewing its newly minted elements into the universe. Supernovae can also unleash cosmic rays that break apart larger atoms to create lithium (atomic number 3), beryllium (atomic number 4) and boron (atomic number 5). This process is the main source of these elements in the universe. That the elements up to iron were cooked up in stars has been more or less settled for decades, thanks to the work of British astronomer Fred Hoyle. The origins of the rest of the elements has been more difficult to pin down. Heavy elements form when a seed atom like carbon or iron gets bombarded with neutrons and captures them in its nucleus. 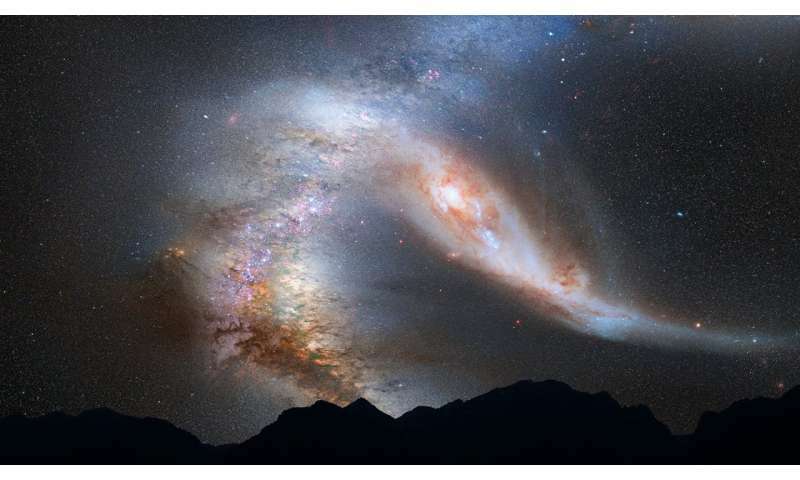 "It swallows them all," said Anna Frebel, an astronomer at MIT. "Then the question is, does it like it or not? And usually, it doesn't." So the atom undergoes radioactive decay, and ultimately emerges as a heavier and more stable element. B2FH laid out the physics for how this process could happen rapidly or slowly. One obvious candidate for the rapid process was the chaos of a supernova. But in recent years, scientists have started to question that idea. "There's probably not enough oomph even in a massive supernova explosion to create all these elements," Frebel said. Some of the evidence comes from Frebel's research on a small galaxy that contained heaps of gold and other heavy elements. If all of them had been the result of supernovae, it would have required so many that "you're going to blow the galaxy apart," she said. Instead, scientists have begun to favor a different phenomenon: mergers between neutron stars. Neutron stars are ultra-dense spheres left behind after the deaths of massive stars. They can have diameters as small as 12 miles and masses up to 2.5 times that of the sun. Occasionally, two of them get locked into a deadly tango, spiraling toward each other until they collide. These mergers release a rain of neutrons intense enough to create the heaviest elements in the universe, like uranium (atomic number 92) and plutonium (atomic number 94). This idea was bolstered in 2017, when the Laser Interferometer Gravitational-Wave Observatory detected a neutron star collision for the first time. Researchers studied the light from the explosion and found the telltale fingerprints of heavy elements, including gold. Scientists still have to sort out the relative roles of superovae and neutron star mergers. But Frebel said scientists are getting closer to understanding the source of every element. "The last big gap has been closed," she said. "That's just nice." The first neutron star mergers occurred after the first generation of stars died, and they splattered the cosmos with all kinds of new atoms. That includes some that are so unstable that they don't exist in our solar system today—except for a few milliseconds in a researcher's lab. "You whoosh all the way through the periodic table," Johnson said. "So within about 200 million years after the Big Bang, you've made some of every element." But the composition of the universe kept changing. Over the next 1 billion years, new cosmic processes began boosting the abundance of certain elements as smaller stars started to form. These stars aren't big enough to produce anything heavier than carbon and oxygen—or to blow up as massive supernovae. Instead, when the fusion in their cores ceases, they decay into white dwarfs. White dwarfs can collide, triggering a runaway fusion process that converts almost everything in the star into iron. "You can create basically an iron bomb," Frebel said. Before that, during their protracted deaths, some low-mass stars can also incubate heavy elements. Neutrons left over from their helium-burning days glom onto the nuclei of other elements at a rate of about one every few weeks or months, gradually building heavier atoms that inch across the periodic table. It takes more than 100 captured neutrons to convert an atom of iron to a rare earth element like lanthanum (atomic number 57) or lutetium (atomic number 71). However, there are plenty of these stars, and they hang around for a long time, so they produce roughly half of the elements heavier than iron. An astronomer named Paul Merrill found evidence for this process in 1951. Working at the Mount Wilson Observatory above Los Angeles, he identified the radioactive element technetium (atomic number 43) in an ailing, ancient star. Scientists knew technetium was unstable and quickly decayed away. That meant it couldn't have been inherited by a star that was already billions of years old, Merrill realized. The only way the element could have gotten there was if the star had made it. Today, 13.8 billion years after the Big Bang, stars have converted about 2 percent of the universe's hydrogen and helium into other elements. The presence of elements like carbon and oxygen helped cool corners of the galaxy so that smaller stars like the sun could form. And the appearance of metals allowed solar systems to emerge from the discs of gas and dust that swirled around these new stars. "There's now enough junk in the disc that you can form planets," Johnson said. "The more iron compared to hydrogen, the more likely we are to find a Jupiter." As the universe ages, the elements within it will get heavier. And in about 10 trillion years, when star formation has fizzled, its composition will stop changing. There's debate about how much hydrogen will be left at that point. Johnson thinks a fair amount will remain in the intergalactic medium, while Frebel suspects most of it will have been transformed. But it will still exist in another sense, she said, since all elements are really just rearrangements of the hydrogen atoms that formed in the first minutes after the Big Bang. They have been kicking around the cosmos ever since, in one element or another. Some wound up here on Earth, where they make up everything. Including us. The beloved astronomer Carl Sagan was fond of saying that "we're made of star stuff." That's not all, Fredel said: "We are also Big Bang stuff."